The clocks have gone back, the proper coats are back out and the Halloween celebrations are just winding to a close – Autumn is officially here. And for many, the start of this new season means that a particular celebrity programme is well on its way to being back on our screens. That’s right – I’m A Celebrity should be hitting our screens in mere weeks, hurrah! Which means that millions of expectant viewers are eagerly awaiting the line-up of brave household names for the show. And according to an excited tweet, Charlotte Crosby is heading to the jungle this year! More: I’m a Celebrity under threat – by CLOWNS?! The former Geordie Shore star took to social media on the weekend to reveal to the exciting news to the public. ‘Yep I am going on @imacelebrity I can’t wait,’ she began her Tweet on Sunday (30th October). ‘Excited man’! That was a joke btw. And as one might expect, fans who were incredibly vocal about supporting her had plenty of feelings about her cheeky trick – and disappointment is an understatement. Eek! Yet some Twitter users aren’t entirely convinced. 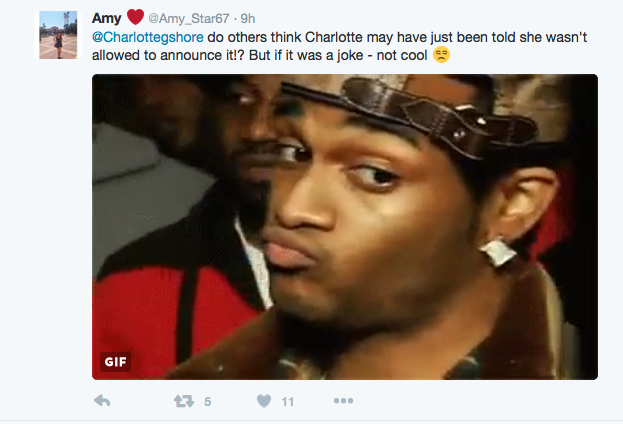 With Charlotte having tagged the official I’m A Celebrity account in her original tweet, the announcement seemed pretty genuine.